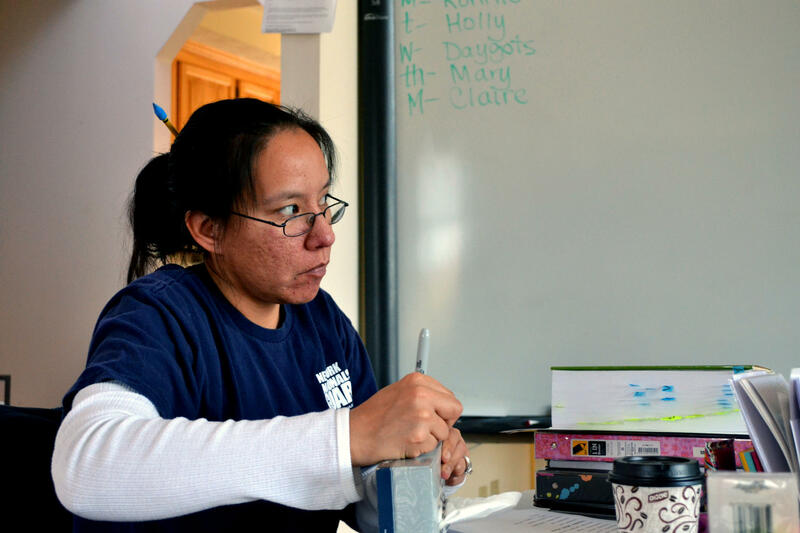 Holly Gibson teaches one of two Oneida language adult classes, but attendance is sparse. A student holds a stack of laminated cards, each with a picture of a household item. She works her way through the cards, identifying each picture in Oneida. The Oneida language is being taught the old fashioned way in a community room on nation territory. Flashcards for repetition and nearly every item in the room is labeled with its name in Oneida. Like many Native American vocabularies, The Oneida Indian language is on the brink of extinction. This is one of two fulltime adult language courses the nation is running. But the room is not full. Attendance has dropped from 10 to three in the year since it began. Claire Patterson is one of the people left in the course. She’s learning Oneida because she wants to be able to someday teach her children the language. "They would be hearing Oneida all the time. So that’s how I want to teach them," she said. "Not in class, but in real life things, like telling them, ‘Don’t do that’ or ‘eat your vegetables’ and all that good stuff." Mary Cook labels a tissue box with its word in Oneida during a language class. 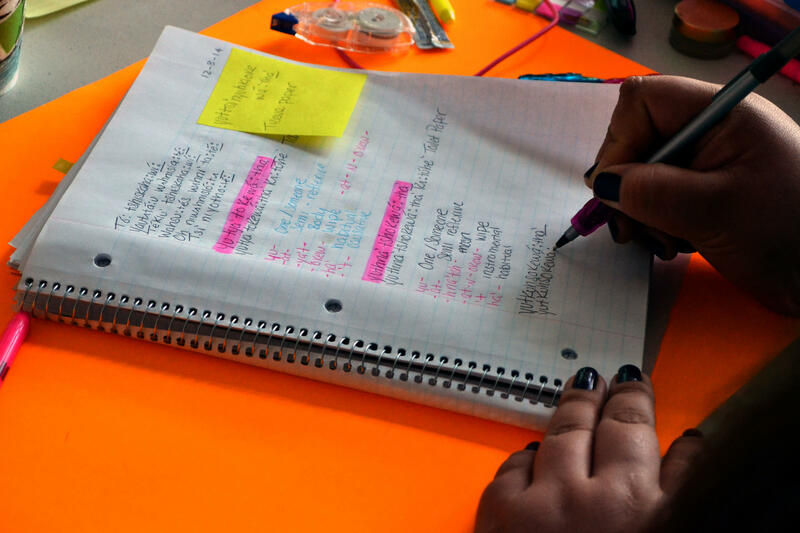 Patterson and her classmates spend four days a week studying. They’re being paid by the nation to learn their native tongue. Holly Gibson teaches the class but she admits even she is not fluent in Oneida. She’s the voice though of a language app the nation will introduce next month. Randy Phillips is the Oneida Nation’s assistant manager for education. He says with only a few dozen native speakers, the nation hopes the app will supplement traditional language learning. "Right now it’s the best thing that’s out there," he said. "And a lot of tribes are trying like we are to get something done so that’s it’s archived. And that’s the beauty of it, it’s forever saved in that respect." The language program will have 500 common words and phrases. Gibson, the teacher and voice of the app, says it was no easy process to come up with even that much vocabulary. "We had two of the previous students make up the list and then I helped them with words and the spelling of them, getting them typed them up, making sure they were all correct," said Gibson. "It took like a two year process just to make sure every marking was in there, every spelling was correct." They had to cross check everything with the only fluent Oneida speaker left, who lives in Canada. Oneida is very descriptive. It’s also a very old language that, with no active speakers has not evolved with the times. A challenge for those in the languages courses, like Claire Patterson, is finding people outside the classroom to practice with. "If they were on the app and they were listening to it and them someone knew that you could speak Oneida and they tried talking it to you, that would be awesome," Patterson said. "That would be one of the things to look forward to with the app." "With any language, if you don’t practice you’re going to lose it. So is it a tall order? It’s a hugely tall order," said Phillips. The app is not intended to make anyone fluent or replace a language instructor, Phillips said, "but it gives people the opportunity to hear the language and practice it and maybe fall in love with it to the point where they'll want to take some classes." A decade-old dispute between traditional leadership in the Cayuga Indian Nation and its representative to the U.S. government has boiled over. The two factions are now battling over control of the nation's business interests in the Finger Lakes. After the death of a Cayuga chief in 2003, Clint Halftown became the nation's federal representative. When new chiefs, including Sam George, were installed by clan mothers a year later, they say they removed Halftown from that role.